Yes, More Craft Fair Projects! 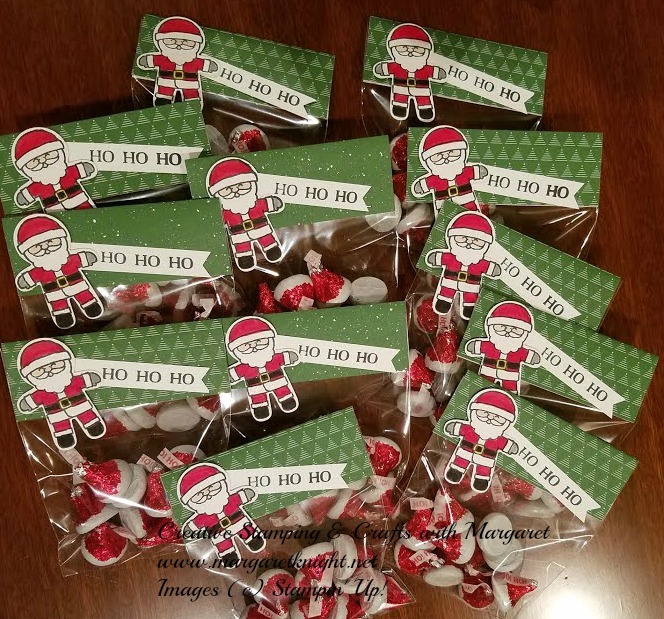 This will be the final post of the week containing projects from the recent Holiday Bazaar – acetate treat boxes and rosette ornaments from the Be Merry Project Kit. The acetate treat boxes being shared are another design courtesy of Connie Stewart on her blog. Not only are the treat boxes simple to make, they are super cute! I’m loving the acetate boxes offered by Stampin’ Up! as they are very versatile and make great packing for more than cards. For this project, just cut a box in half and used designer series paper (DSP) to create a closure for the box. 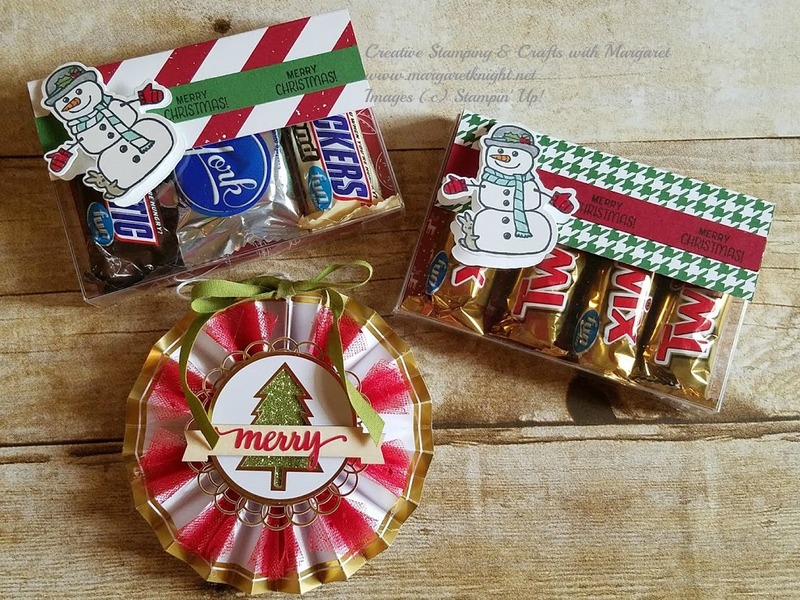 The 3″ x 4 1/2″ box size is perfect to holding fun size candy bars but can also accommodate non-candy items. 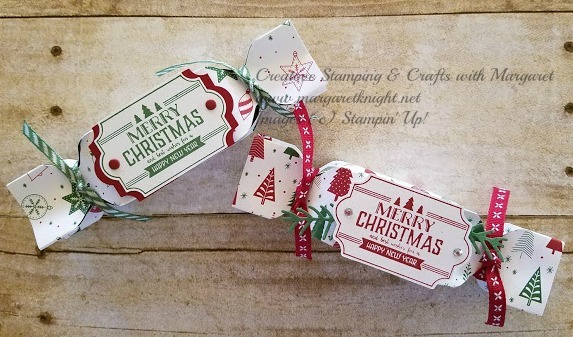 The Be Merry Project Kit requires no stamping and comes together quickly. To speed production for the Holiday Bazaar, I separated the kit and set up an assembly line. Using a hot glue gun, I was able to complete two kits (24 rosette ornaments) in less than an hour. Many of the ornaments sold and the remaining ones are being used on some of my holiday packages as gift tags. Be sure to check out the retiring list to order some of your seasonal favorites before January 2nd. Thanks for stopping by and check back on Monday for a new project idea! Today two projects are being shared. Both of the designs were shared by other demonstrators on their sites and I thought the items would be great for the holiday bazaar. The first was from a post by Connie Stewart and is a fingernail file cover. The file cover was very quick to make and the 20 that were made for the bazaar sold out in just a matter of minutes. I promoted them as stocking stuffers but one lady purchased several to include in cards she was sending to friends – what a great idea! The second project is from Marisa Alvarez. 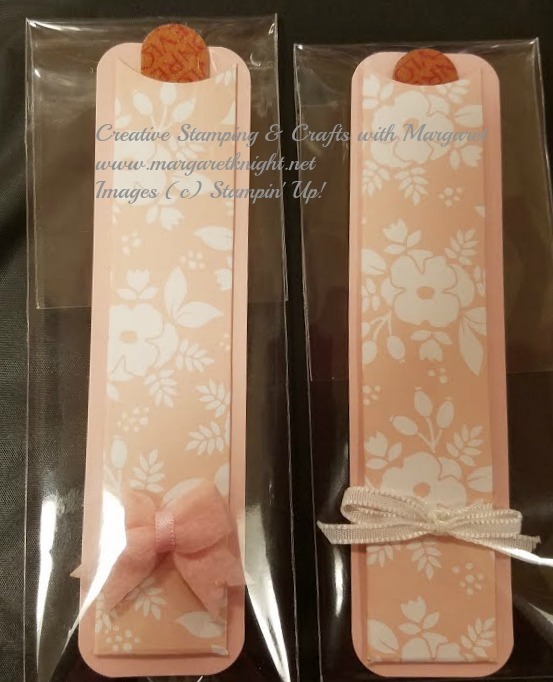 I had purchased several packages of pencils from the dollar store for use in another project but spied her use of the Many Mittens Framelits Dies to embellish a pencil package and decided to make a few for the dollar section in my booth. Best thing is you can use scraps of cardstock for much of this project. You can find a list of project materials listed at the end of this post. Several items such as some ribbons and the 1″ cello bags (used for the pencil packaging) are retired but you can easily find substitutions. Thanks for stopping by and check back tomorrow for another project from the bazaar. 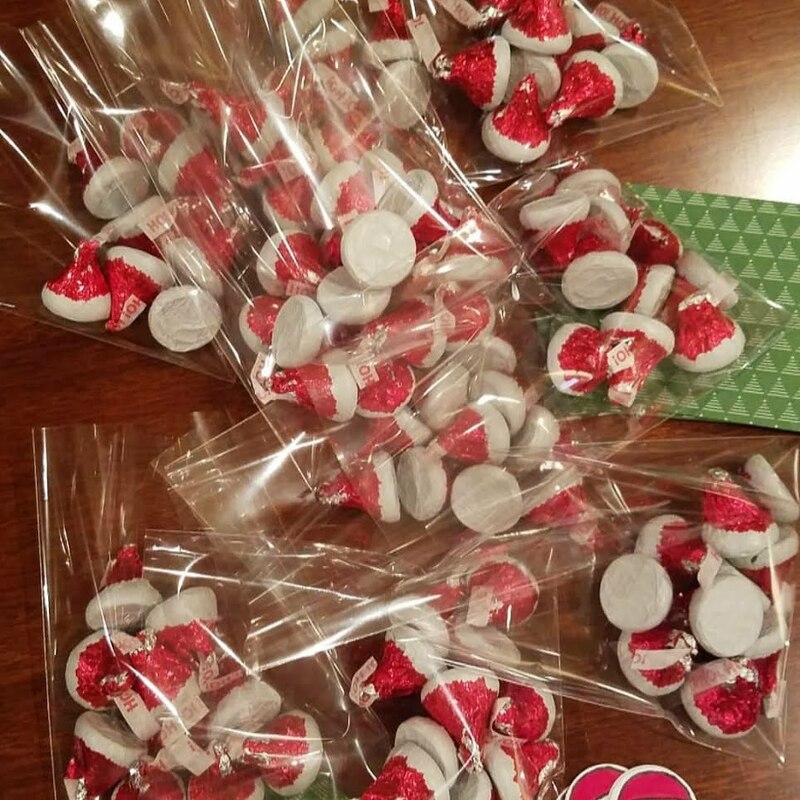 Here is project number two from the Holiday Bazaar as detailed in my last post…Holiday Treat Poppers containing 2 Ferrero Roche candies. 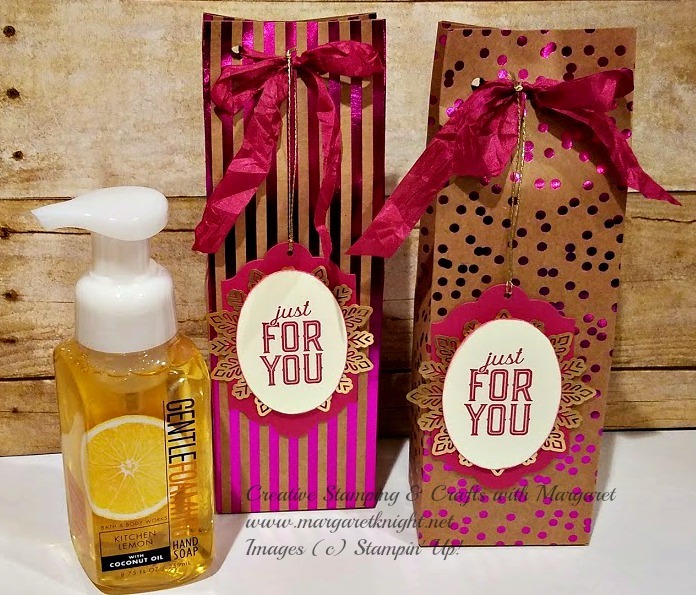 Another great table favor, stocking stuffer or small thank you treat to handout! The poppers were easy to make using a 6″ x 6″ square of Be Merry Designer Series Paper (DSP) and the envelope punch board. After punching and assembling the poppers, the ends were tied with ribbon. The green ribbon has been discontinued but the Cherry Cobbler 1/4″ Double-Stitched Ribbon is current. Garden Green cardstock was cut using the Pretty Pines Thinlits Dies to embellish some of the treat poppers. On some of the poppers, Real Red cardstock was cut using the Everyday Label Punch and snipped in half before adhering to the back of the stamped sentiment label to create a border. The poppers are the perfect size for holding a few treats for the holidays. Thanks for stopping by! Check back tomorrow for the next project from the bazaar. As promised in the post, here’s the outcome – Santa Kisses! 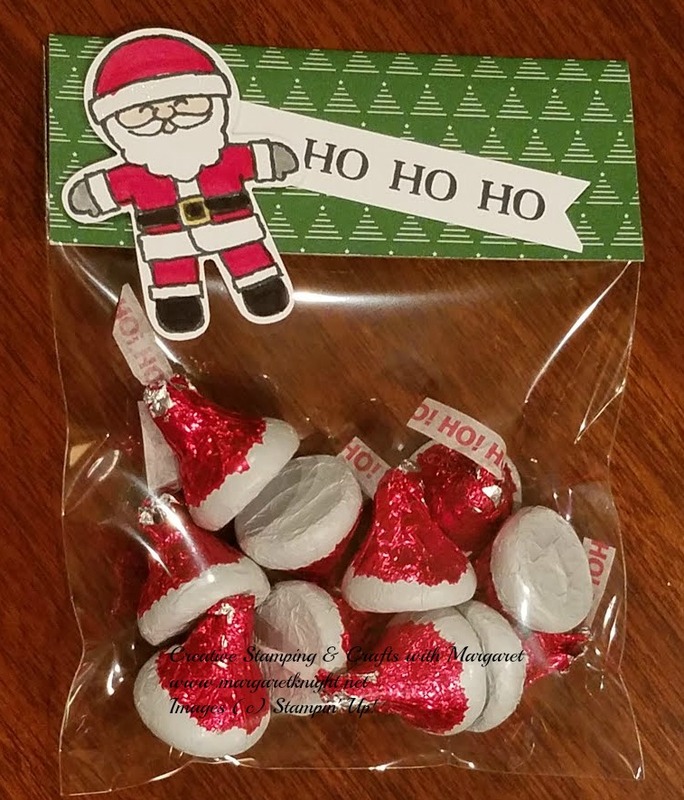 The Santa Kisses were a popular item and so easy to prepare the packaging. The Santa from the Stampin’ Up! Cookie Cutter Christmas set was stamped onto Whisper White card stock and punched using the coordinating Cookie Cutter Builder Punch. Stampin’ Write Markers in Real Red, Basic Black, Smoky Slate, Daffodil Delight and Blushing Bride were used to color Santa. It doesn’t show in the photograph, but the fur along Santa’s hat and suit were highlighted with clear Wink of Stella. The tag was stamped in Memento Tuxedo Black ink using the sentiment from Oh, What Fun stamp set. Since I have a stockpile of retired 4″ x 6″ cellophane bags, I used them but the 3″ x 6″ Gusseted Cellophane Bags would work great. I folded down approximately one inch of the bag and added a tag topper cut from the Be Merry Christmas Designer Series Paper. A couple of staples along the bottom edge of the paper sealed both the cello bag and the topper. 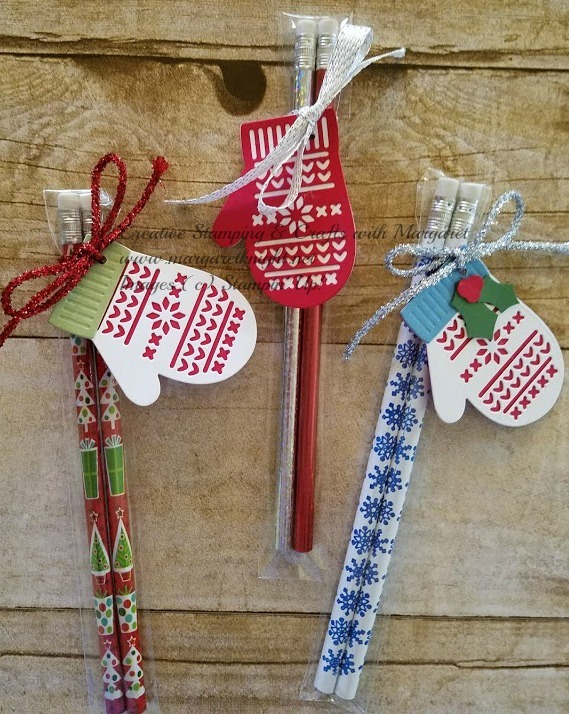 If you’re looking for a quick and easy treat holder for table favors or stocking stuffers, these are perfect! Need product for these items, click Shop Now to purchase and for today only, Stampin’ Up! is offering FREE Shipping. Thanks for stopping by and check back tomorrow for another project from the Christmas Bazaar!